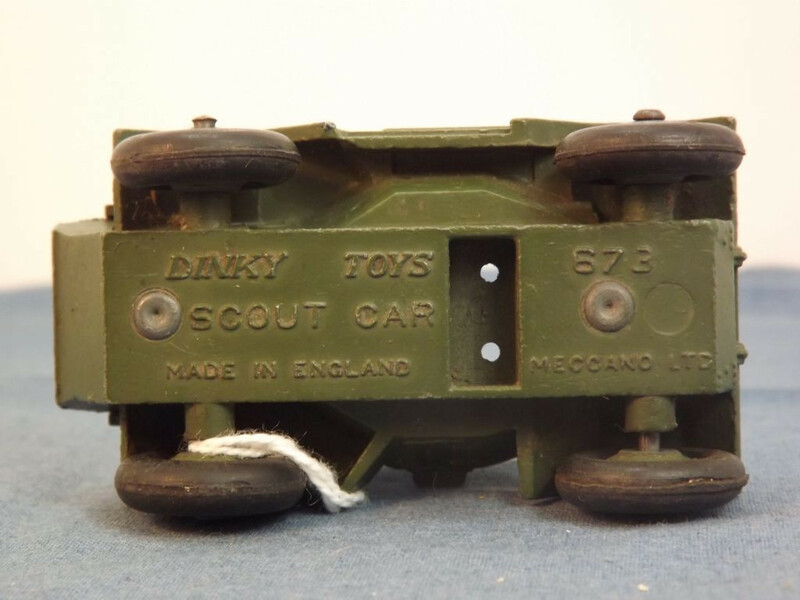 This model is the Dinky 673-G-1 Daimler Scout Car in Dull Olive. This particular model came without the box. 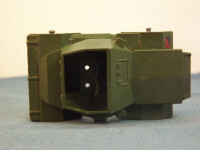 The model features no opening parts as is common for the period and all features are cast into the body casting. 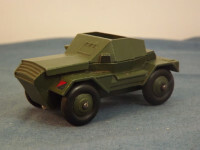 At the front the driver's and gunner's viewing hatches are cast into the body,. On the right guard is a military insignia/flag. The cab area shows the side door hatch, tool/ammunition boxes and other detail, including the rear hatch. The rear body consists of the engine hatches, rear radiator grille, and another insignia on the right hand rear mudguard. The model has no glazing. All wheels are of the cast metal type - solid one piece cast metal hubs, with a separate black rubber tyre, mounted on domed, steel axles. The base plate is olive metal and is marked Dinky Toys at the top centre, "Scout Car" in the middle centre, "Made in England" at the bottom centre and, towards the front axle, "670" above the rivet and "Meccano Ltd" below the rivet. The base is actually the lower half of the body casting and is attached to the upper body casting by two machined rivets.